I recently shared with you my most cherished cookbooks. One of which is Jamie’s Comfort Food, a collection of globally inspired hearty and involved recipes. I love this book because Jamie really does celebrate what he calls ‘good mood food that will put a smile on your face’. Unfortunately though, as is often the case with cookbooks, despite 100 tempting recipes at my fingertips I’d got stuck on making a mere handful of dishes. Like Big British Meatballs, Winter Nights Chilli and Ossobucco all Milanese. With my meat consumption now limited to once weekly I recently enjoyed a cover to cover comfort food review with fresh eyes. I was on the hunt for meat-free recipes and Jamie’s Comfort Food delivered. I drooled over his vegetarian gems, like ‘divine dosas’ and ‘beans on toast’. It’s the latter I’m sharing here – as my first contribution to the Fiesta Friday party. It’s taken me to Fiesta Friday #125 to finally join the weekly party with my fellow foodie bloggers – better late than never as they say! 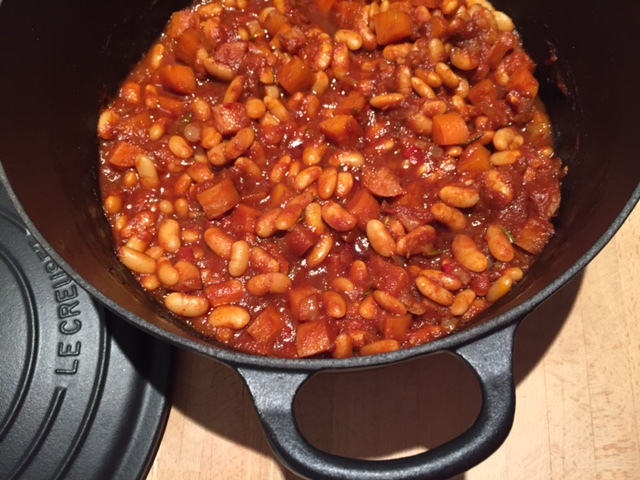 Tinned baked beans were a thing of my poor university days – a quick and cheap way to curb my hunger. Today I wouldn’t touch them with a barge pole – because most tinned baked beans are packed with added sugar and other nasties. Both to preserve the shelf life and to make them appealing to sugar dependent taste buds (like most packaged foods that fill our supermarkets). But home-made baked beans are in another league. Of course there’s time and preparation involved, but you can easily make a giant portion and freeze individual servings for quick meals on busy weeknights. I promise – try Jamie’s recipe and you’ll make the tinned variety a thing of the past. And if you stay away from baked beans, for the reason I mentioned, then this will get them back on your radar. Although Jamie uses tinned cannellini beans I used dried ones, soaked overnight – they allow for a longer cooking time that increases the richness of the sauce. I’ve also made some other slight adaptations to Jamie’s method that you can see here, like using coconut oil and stock. Heat the coconut oil in an oven proof pan or pot. Once hot add the rosemary leaves and fresh chilli. Cook on a low heat to allow the flavours to infuse for 10 minutes. Then add the chopped onion and garlic to the pan along with the paprika and continue to cook until soft. Add the balsamic vinegar (optional) and cook until it reduces. Then add the tomatoes and a few splashes each of Worcestershire and Tabasco sauce. Drain your tinned beans or dried beans and add to the pan. Add 100ml of stock or water (200ml for dried beans). The longer cooking time for dried beans means more water is needed to keep the sauce rich. Cook for a few minutes to bring to a simmer and also season with salt & pepper. Moisten one side of a sheet of baking paper with water and then place the sheet (moist side down) over the pan, followed by the lid. Transfer to a pre-heated oven at 160C. Cook for 45 minutes for tinned beans and 90 minutes to 2 hours for dried beans. Serve simply with toasted bread lathered in butter or for an extra wow factor do as Jamie does and also top with grated cheddar cheese. 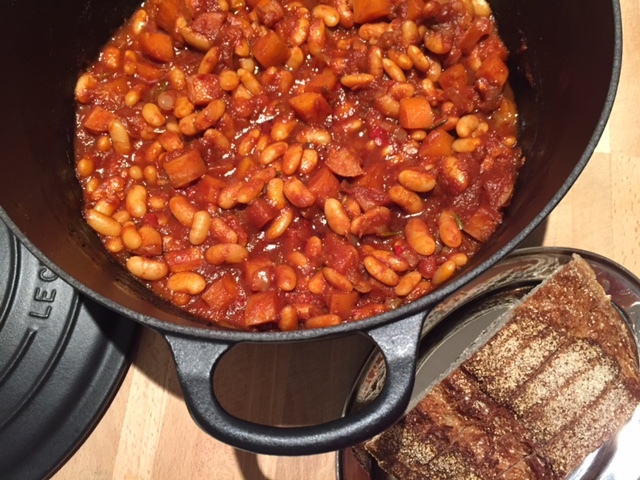 Tags: baked beans, Fiesta Friday, Jamie Oliver, recipe, toast. Bookmark the permalink. So glad to hear Elaine – I enjoyed one of my frozen batches last night and they tasted just as good! mmm. . . I love homemade baked beans. I sometimes make them using canned beans, but I haven’t started with dried beans in years. This post makes me want to try using the dried beans again. Hi Sheryl thanks for stopping by and yes dried beans are great because they allow for a longer cooking time – and this makes the sauce so much more delicious!